Cool Chromes is a regular feature that looks at some recent slides that have passed through the scanner. In this edition of Cool Chromes we'll head to the Great White North for a look at some passenger trains in the Toronto-Montreal corridor. 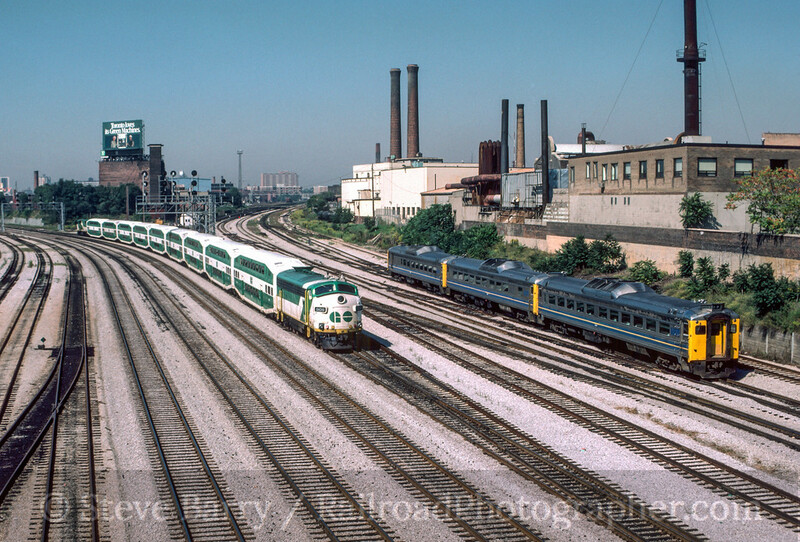 Our first stop is on the Bathurst Street bridge in Toronto (also a great place to watch streetcars) in September 1986 as two trains you won't see anymore head out of Union Station (both trains are going away in this shot). On the left is a GO Transit commuter train, complete with a de-motored F-unit as a cab car. On the right is a VIA Rail Canada train made up of Rail Diesel Cars. Today VIA only uses RDC's on some remote services. Next we'll head over to Montreal. 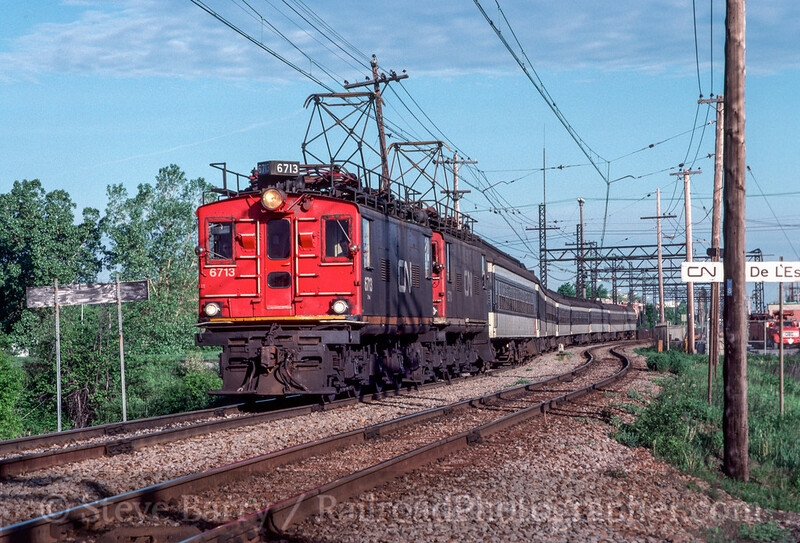 It's June 1989 and the ancient electric locomotives hauling passenger cars between Gare Central and Deux Montagnes are on short time. In just a few years the line would be upgraded and the locomotive-hauled trains that passed through the Mont Royal tunnel would be replaced by new multiple unit electric cars. I had thought I only shot these in bad weather, so it was indeed a pleasure to discover I actually spent a sunny day along the line. 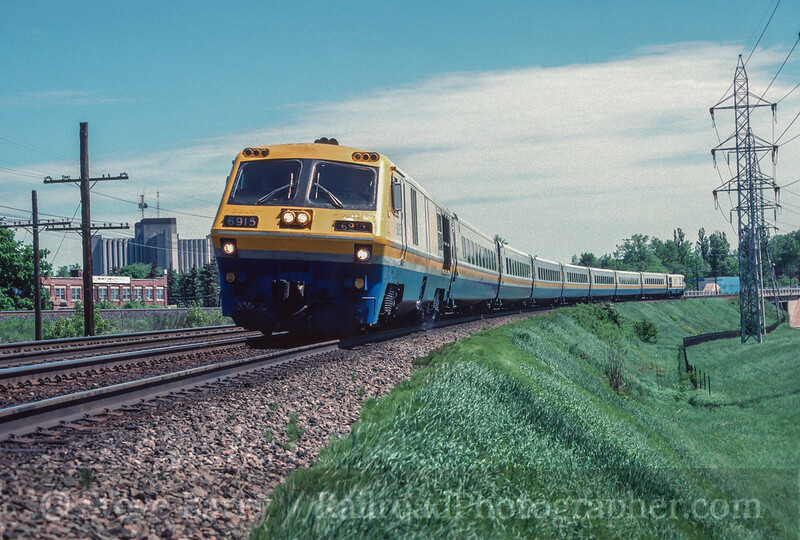 From that same trip in 1989 we find a VIA Rail Canada train using the LRC equipment (Light Rapid Comfortable) built by the Montreal Locomotive Works for high speed service. The low-slung cars allowed for faster speeds on curves; indeed, long after the sleek locomotives were retired, the cars continued in service behind conventional passenger diesels and still retained their higher speed limits. Here we see a complete LRC trainset with locomotives at both ends racing along the Canadian National away from Montreal. We finish off our quick visit to Canada just a few miles from and two years before the previous shot. Now we're at the layover yard for the commuter service provided by Societe de transport de Montreal between Dorion and Montreal. An annoying yard light was making this shot difficult (this was lit using old fashioned giant No. 2 flashbulbs) and a worker graciously turned off the light, leaving teh yard mostly dark for the flash work. Today the F-units are gone. As are the LRC's in the shot previous. As are the electrics before them. 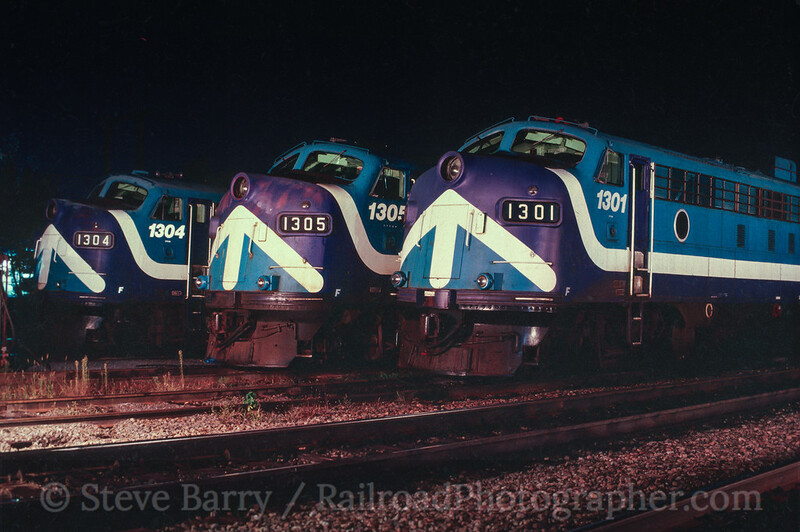 As are the RDC's and the F-unit cab car in the first photo. A lot has changed in the Canadian passenger scene in 25 years.